The Brown Pelican is one of the most iconic birds of the California Coast. But five years after the species was removed from the endangered species list, its long-term survival is by no means certain. In 2014, International Bird Rescue is teamed up wtih Audubon California to ensure that a legally mandated, coordinated monitoring effort of Brown Pelicans is successfully implemented. You can read more about this effort below, including a Los Angeles Times op-ed by International Bird Rescue. For more information on our Blue-Banded Pelican Program, click on the links to the right. 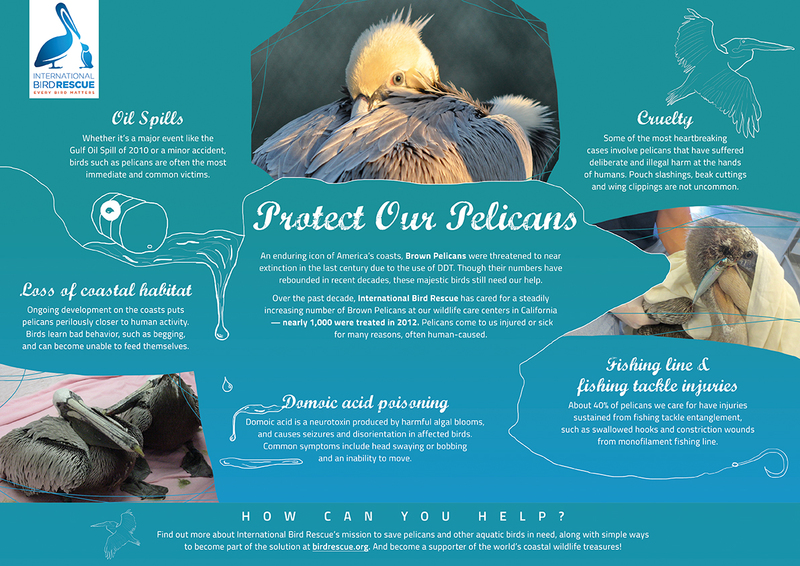 You can lend your voice to the movement to protect the Brown Pelican here. Over the last several months, a young brown pelican's obsessive preening regimen has dominated the view from my office window at the Northern California wildlife hospital where I work. We don't name the patients we care for - if animals could talk, I imagine the first thing they'd express is their dislike of anthropomorphism. But I can't stop thinking of him as Red, because of the colored temporary band on his right leg. Red's the closest thing I've had to a cubicle mate. He came to us in September with a severe injury to his left patagium (a fold of skin on the leading edge of the wing) caused by an embedded fishing hook. Stretching his wings out, Red often tips forward and balances on one leg, like a yogi in warrior three position. The aviary that houses Red can have as many as 100 convalescing brown pelicans at a time. Typically they arrive in summer, mostly hatch-year birds from nesting colonies in the Channel Islands and Mexico. All pelicans must learn the kamikaze technique of diving for fish from great heights in order to survive. But in recent years, even the ones that master the skill have suffered along the California coast. Theories as to why abound: severe weather driven by climate change, a crippling sardine crash, the unknown effects of these and other variables colliding. All of this has meant we've received an influx of sick pelicans in recent years, often picked up from peculiar places: supermarket parking lots, for instance, or on shoulders of L.A. freeways strewn with broken glass. A few years ago, a pelican was brought to us by squad car after crashing on the Golden Gate Bridge and blocking traffic. These aren't cases of pelicans that have become habituated to humans and are begging for handouts at Whole Foods. Often they're starving and going to great lengths to feed themselves, but the inland places where they've ended up happen to be urban pavement. Whatever's happening, it's not following the "mission accomplished" script written by the federal government for an animal that spent decades on the endangered species list. Called "one of the most interesting of our American birds" by John James Audubon, pelicans were targeted by egg collectors and hunters of the 19th and early 20th centuries, and their feathers were sought-after by the millinery trade. The rampant slaughter of pelicans and other birds led to the first federal wildlife protection law in 1900. America's first national wildlife refuge followed in 1903, a five-acre mangrove island home to a pelican rookery in Florida's Indian River Lagoon. Even so, pelicans were no match for DDT. Widespread use of the insecticide in the 1940s and 1950s caused the eggshells of many species, including pelicans, to thin. The result for birds such as pelicans was that they broke the eggs they so ardently tried to protect in their nests. The brown pelican population plummeted, and the birds were listed as federally endangered in 1970, two years before the Environmental Protection Agency banned most DDT use. This year marks the five-year anniversary of the U.S. Fish and Wildlife Service's removal of the brown pelican from the endangered species list. "At a time when so many species of wildlife are threatened, we once in a while have an opportunity to celebrate an amazing success story," former Interior Secretary Ken Salazar said in 2009. "Today is such a day. The brown pelican is back!" But delisting a species is not the final step in its recovery. By law, wildlife officials are required to monitor formerly threatened or endangered species for a minimum of five years to ensure they don't return to a fragile state. For example, in 2007, when federal authorities removed bald eagles from the list, a "post-delisting monitoring plan" established nest surveys to detect any population declines that might merit further investigation. A 2009 draft plan for brown pelicans called for a 10-year monitoring effort. Data collection on prey availability, nesting success and contaminant exposure were all recommended for breeding ranges along the West Coast, as well as the Gulf of California, the Gulf of Mexico and the Caribbean. The plan was never finalized, however, and no coordinated effort has taken place. That failure, which officials seem to blame on a lack of funding, could prove disastrous. Biologists have been pleased to see abundant pelican nests on Anacapa Island in recent weeks, probably boosted by a spike in the anchovy population. But unusual mortality events, coupled with near-total nesting failures in the Channel Islands during other recent years, have left many West Coast seabird advocates concerned about the lack of comprehensive monitoring data. "We don't think it is OK for the service to do a high-five and walk away from the brown pelican just as it seems to be entering troubled waters," Anna Weinstein, Audubon California's seabird conservation director, said last fall. Pelicans like Red don't inhabit the upper echelons of "charismatic megafauna" - the polar bears, gray wolves and blue whales of the world that command the subject lines of "donate now" appeals. A pelican's charm is more sotto voce. In fact, they're largely silent, unless you count an occasional breathy grunt. Last year, an NBA franchise named its team after my favorite bird, and I had hoped this might raise its profile. But the only change I've seen is that basketball news and trivia now dominate Google searches for "pelican." The bird that Audubon so admired still needs a savior. Meanwhile, I'm hopeful Red will be sprung from our aviary soon. Like all pelicans, he belongs high above the waves, eyeing plentiful schools of fish, in search of a comely mate and the perfect spot for a nest. Andrew Harmon was communications director 2012-2014 for International Bird Rescue in California. Protect Our Pelicans by Franziska Muller. Click on the image to enlarge.